Russian police nab suspect, heard shouting 'I am a terrorist! ', outside metro station in Moscow. 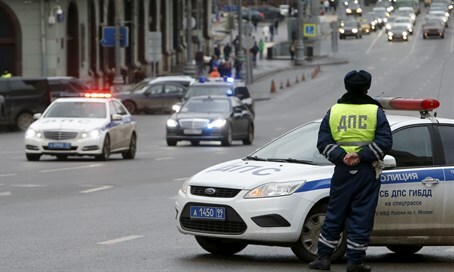 Police in Moscow have arrested a Muslim woman who was spotted brandishing a child's decapitated head near a metro station in the Russian capital. According to numerous Russian media outlets, the woman - dressed in a black burqa - was heard shouting "Allahu Akbar" and "I am a terrorist." Video footage from the scene shows her pacing back and forth, gesturing with her right hand while holding what appears to be a severed head in her left hand. According to the Russian-language LifeNews website, the woman had been stopped by police - seen in the video standing at the entrance of the metro station - at which point she pulled the head out of her bag and began shouting "I am a terrorist." According to Russia's RT state media, rescue forces responding to a fire at a nearby apartment complex found the headless body of a young child aged three or four years old. The killer is believed to have been babysitting the young girl. She reportedly beheaded the child before setting the apartment on fire. Police say the suspect is a female citizen of a "central Asian country" in her late thirties. The incident is not being treated as a terrorist attack.